BRIGHTON WOMENS SILVER WATCH "BRAND NEW"
Brighton Paris Watch Reversible Band 6-7 1/4"
The battery is working and is included. See our website sharonsweb dot com OR sales4autism dot com for more info! Parents teachers and friends of teens and adults with autism who are nonverbal or have limited conversational ability. The watch is affixed to a Brighton backing - The watch is working and shows no signs of wear. Swarovski Crystal Accents Watch Face. Watches both have dead batteries and will need new batteries to work.A more detailed reference for condition can be found in the pictures. Condition is Pre-owned. No Marks or scratches possibly never worn in Brighton heart tin. This is a pre-owned watch with some wear/scratches. Battery needs to be replaced. Adjusted for small wrist, but will include extra links/pin. See pictures. Brighton Dana Point Blue Watch. Condition is Pre-owned. Retails for $125. I BELIEVE IT NEEDS A NEW BATTERY ,BECAUSE I HAVE HAD IT IN STORAGE FOR AWHILE. THE BAND IS SMALL HEARTS WITH A DESIGN ON THEM. Brighton silver reversible Bridgeport watch with brown leather band on one side and black leather on the other side. Leather shows wear especially on the brown side. Needs battery. For instance, a watch needs a battery but when installed it does not work. Brighton Black And Silver Brooklyn Watch. Condition is Pre-owned with some wear/scratches. Adjusted for small wrist but will include extra links/pin. Retails for $125 on Brighton website. Brighton silver and gold Alta watch. Needs battery. Gold is wearing off. Discoloration in photos is due to reflection. For instance, a watch needs a battery but when installed it does not work. BRIGHTON WOMEN'S OVAL FACE PEARL SILVER BAND. Condition is Pre-owned. Comes as shown. Needs a new battery. Will ship to 48 contiguous United States via USPS. Condition is Pre- ow ne d. C om es w it h originalbox. Ba tt er y is i n wo rk in g co nd it io n.
Beautiful watch in great condition! Brighton Amalfi Ladies Watch with new battery Silver Brighton Band in Brighton heart shaped metal box. Condition is Pre-owned and works great.Shipped with USPS First Class Package. Band is 7" in length, extra link can be removed to shorten. Finish is silver plated. There are some minor scratches to the silver case near the number 3 that are barely noticeable. See last photo. Just saw a new one at the Brighton store for $105. Brighton silver Oakland watch with black leather band. 6 3/4” long with fold over clasp. Needs battery. For instance, a watch needs a battery but when installed it does not work. Brighton Champagne watch. Silver with gold colored accents and black Italian Calfskin band. Oval face. 8" long, 3/4" wide. Beautiful Celtic style Brighton watch. Not currently working, needs a new battery. Can be taken to a Brighton store. Less than $10 repair. Condition is Pre-owned. Comes with tin. Shipped with USPS First Class Package. Brighton silver Geneva watch with black leather band. Needs battery. For instance, a watch needs a battery but when installed it does not work. Brighton silver Vienna watch. Does not have extender chain. Toggle is placed through band ring. Needs battery. Has slight tarnish. For instance, a watch needs a battery but when installed it does not work. Authentic Brighton Tampa Two tone Silver & Gold Wrist Watch. It has a rectangle shaped white face surrounded by a silver case. The Watch is in Excellent Used Condition and has a NEW Battery. Ws just sent into Brighton for new battery and cleaning. Condition: S cratches and lacquer finish wear from normal use. No missing crystals. Crystal is in excellent condition with no apparent scratches. The clasp is not original to the watch but is a Brighton clasp from a bracelet. In fine shape are these 3 ladies Brighton watches and they all need batteries. The watches are Terrassa, Hamilton and Champagne. New Listingbrighton tuscany womens toggle bracelet watch running! Working or use the parts! Needs new battery. All pre-owned watches will include general signs of wear such as light surface scratches or tarnishing. BRIGHTON NANTUCKET WATCH~ SILVER & GOLD DETAIL~LIGHTWEIGHT~EXTRA LINKS~VERY NICELY DETAILED~TOGGLE CLASP~ORIGINAL TIN BOX. Just needs a new battery. Brighton silver and tortoise shell Monte Carlo watch. Silver is tarnished. Needs battery. 7 1/4” with fold over clasp. For instance, a watch needs a battery but when installed it does not work. IN NICE PREOWNED WORKING CONDITION. Brighton Orchard watch with silver case and buckle and brown leather band. Needs battery. Minimal scratching on glass. See photo. For instance, a watch needs a battery but when installed it does not work. Lovely Brighton Watch in the Santa Rosa design. Lovely watch.your chance for a bargain. Nice Condition. Brighton silver and gold Venezia watch. Needs battery. Glass has small scratch in upper corner. For instance, a watch needs a battery but when installed it does not work. Watches are tested with a HoroTec Turbo Pulse. If any gems or stones are present, they are tested with a Presidium Gemtester. This watch runs. Band Material Band Length We do our best to provide accuracy. ONE FULLY FUNCTIONING BRIGHTON WATCH. WILL NEED A NEW BAND. 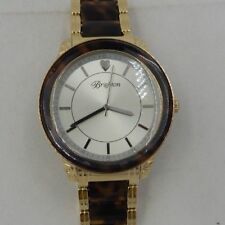 BRIGHTON SILVER & GOLD TONE VENEZIA WRIST WATCH. TOGGLE CLASP. IN NICE PREOWNED WORKING CONDITION. Brighton Hamilton Watch. Condition is New with tags. Square face. Silver. Shipped with USPS First Class Package. Beautiful Brighton Watch 165 Feet WR Date Window. Condition is Pre-owned. Shipped with USPS First Class Package. Official Brighton case is included. Beautiful two-tone silver & gold, love-my-cat inspired bracelet watch with toggle closure. Very gently pre-owned condition. New Listingbrighton peru womens watch new battery fitto 7 in. wrist has wear but cheap! Has wear but priced right. or use parts?. Purple band wristwatches are great for adding a hint of color to any look. With a unique band color, they are excellent for a one-of-a-kind accessory. Silver band watches are versatile timepieces, which you'll love wearing every day. Impressive in their simplicity, they have a traditional appearance for a perfect wardrobe staple. Defined by their glossy silver colors with tints of blue, tantalum band watches are high-end investment pieces. They are made from very strong materials for added durability. Silver band watches have a fashionable style, which will add a chic touch to any wardrobe. They have lightweight builds, which make them even more comfortable to wear for any activity. Ivory case watches are traditional and tasteful accessories that will never go out of style. With tasteful elegance, they showcase sophistication and class. Red case watches will add a hint of color to any outfit. They have a unique appearance, which is sure to attract attention at every event. Consider Brighton Nolita Watch Fashionista Chic Crystals Bold Girl Face , which is a highly purchased product on ebay.